Win a $20 Gift Certificate to Amazon.Com! It is EASY and FREE to enter! Visit our Contests for Kids page to enter! Catch it here with Homeschooled Kids! October is here and fall officially arrives on September 21. Everyone speaks of spring fever but have you ever experienced the fever that accompanies fall? Awwwww, there is nothing like the first cool morning when you feel the crisp air against your face or when you first feel the crunch of fall leaves beneath your feet. Throw yourself into the fall season anticipating all that is soon to follow. Thanksgiving and Christmas are just around the corner and that alone should cause your temperature to rise. Instead of mourning the passing of lazy summer days, embrace all the joy that comes with the turning of the calendar page. God creates an appreciation for every season. Have you ever noticed that summer tends to get unpleasantly warm towards the end of August. The cooler temperatures are a welcome change and God intended us to enjoy the variety that he has provided to us with the four seasons. Gather some pretty fall leaves, your crayons and some construction paper. Cut your construction paper to the size of a placemat. Place the placemat over your leaves. With your crayons, rub across the leaves. Place the leaves at different angles and positions to create a pretty design. You can laminate your placemat with clear contact paper. Don’t forget to sign and date your masterpiece on the back of the placemat. These placemats also make great gift ideas! Gather your leaves, markers, crayons, paper and glue. Glue your leaf to your paper. The leaf will form the body and you can draw arms, legs, the head, hats, gloves, WHATEVER!!! Place your hand on a paper and trace your hand all the way up to your elbow. With markers or crayons, color the inside of your outline. This will be your tree. Grab the glue and some pretty fall leaves. Decorate your fall tree’s branches and the bottom of the tree also. Fall Door Hanger Craft - Cute! Gather yellow and green paper, glue and unpopped popcorn. Cut a corn cob and husks shape out of the paper. Spread the glue on the cob and cover it with the unpopped popcorn. All you need to do here is tie a string around a pine cone. Spread peanut butter all over and inside the pine cone. Roll in bird seed. Hang outside for the birds to enjoy! Cut your apple in half. Pour paint onto paper plates. Dip your apple into the paint and blot the excess with a paper towel. If you desire, you can use fabric paint and create a t-shirt. Be creative – you can make pot holders, dish towels, etc. Be sure and use fabric paint for those designs. Making a leaf collection is a fun way to celebrate God’s fall creations. While out walking take along a small box or sack. Look for beautiful leaves that are dry and healthy. After collecting your leaves, you will need to preserve them quickly. Collect fall leaves and press them between wax paper. Cover the paper with a cloth and then use a warm iron to seal the wax paper together. Then you can cut out your leaf and add to your collection! *** It’s very important that Mom or Dad helps you with this project. If you prefer, you can press your leaf between 2 paper towels under a heavy book for 7 to 10 days. This will remove all moisture. Using a photo album or scrapbook, add your dried and preserved leaves to your collection. Be sure to identify your leaf and add your personal thoughts to the page also. Some kids like to add a Bible verse to each different leaf page. O is for OCTOBER which just happens to be ……… National Pizza Month! T is for Daylight Savings TIME which ends on Sunday, November 3rd. O is for ONLINE pumpkin carving fun. E is for the EARTH’S rotation which is responsible for the four seasons. Leaf rubbings can be fun to do also. Collect fall leaves and place under a sheet of paper. Color over the leaf to create an impression of the leaf. Top TEN Ways to Celebrate Fall 2012! 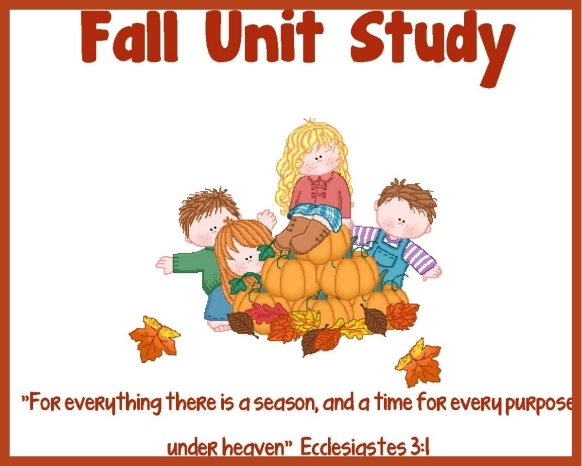 Keep a Fall Journal complete with your thoughts of the fall season. Decorate with leaves you find and other fall treasures. Visit your local pumpkin patch or apple orchard. Make apple cider and share it with some friends. Help Mom or Dad rake leaves and then JUMP into the pile! Go on a Fall Treasure Hunt. Collect leaves, acorns and pine cones. 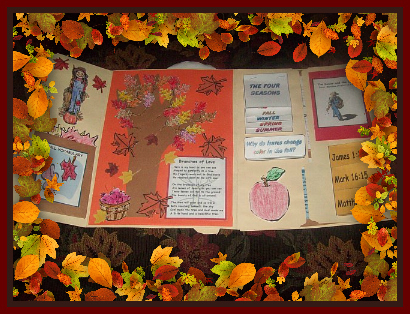 Create great fall crafts to decorate your room. Share these lovely creations with friends or neighbors. Have your very own fall festival! Thank Jesus for giving us such a beautiful season to enjoy!!! Toasted Pumpkin Seeds - Easy! Do you think the pumpkin is a fruit or a vegetable? If you said fruit, then you are correct! Pumpkins are members of the vine family named cucurbits which includes cucumbers, melons, squash, and gourds. Pumpkins can vary in color from white to yellow to orange to green. An average pumpkin contains about one cup of seeds. Let’s visit the apple orchard! When God created apples, he put a BIG smile on most kids faces. Apples are delicious to eat by themselves and are even better in a home-baked pie. While enjoying all of God’s fall creations, be sure and include a visit to your local apple orchard. Wash, peel, core and slice the apples, then place in a large pot. Add the apple juice or water. Cook over medium heat until soft. Remove from the stove and let cool. For a fine sauce, mash with a potato masher. Add sugar, lemon juice and cinnamon, and mix. Freeze in plastic containers, or pour into jars decorated with a handmade apple sticker and give out to your favorite friends. To make, you’ll need 10 peeled, cored apples, cut into 1-inch chunks, 1 cup apple cider, and 2 teaspoons apple pie spice. Place the apples in a large saucepan with the cider. Cover the pot and cook for about 30 minutes over low heat until the apples are soft. Cool, divide into two batches, and puree each in a food processor or blender. Pour all the pureed fruit into a 13-by-9-by-2-inch baking dish, sprinkle with apple pie spice, and stir well. Bake in a preheated 300-degree oven for 2 to 3 hours, stirring every 20 minutes, until your apple butter is deep brown and thick. Cool and scoop it into a clean jar with a sealable lid. It will keep for up to 2 months in the refrigerator.